How do you write about something that you've written about twice before? Is there anything new to add? 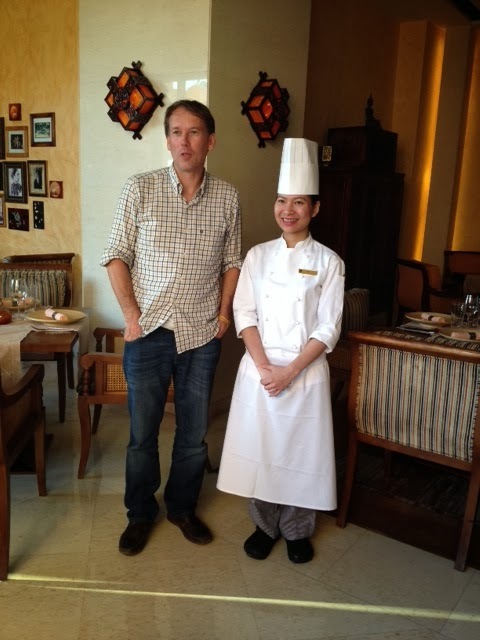 Hoi An, as you know, is my favourite restaurant in Abu Dhabi. I referred to it as the jewel in the crown of Shangri-la. See http://mitsukiemma.blogspot.ae/2013/07/hoi-best-in-abu-dhabi.html. While it is Bord Eau that has picked up all the awards and gets all the kudos, Hoi An, like the no less-worthy bridesmaid who wonders when her time will come, goes about quietly, staying in the background. However, I have a feeling that she will be a bridesmaid no longer. We arrived at Hoi An as a party of 5 for a belated birthday celebration for a friend. It was double excitement because we had with us the editor, creator and photographer of a travel magazine based in Monaco, Jean-Emmanuel. There is always nervous excitement when one recommends a restaurant. I was afraid that I may have built it up too much, and it was hard to relax initially. We were shown to our table by Rashida, who in her inimitable way, gracefully and warmly welcomed us. I find it amazing how many restaurants are unable to appreciate the significance of the moment a guest walks in to a restaurant; it is at that moment that the tone is set for the evening. The tone here was certainly set. And it was fantastic. However, it is not just Rashida who exudes this. She has instilled in her support staff a philosophy of soulful service (that expression again), passion and product knowledge - a balance that is all too often not evident in many establishments. Part of the fabulous Hoi An team. 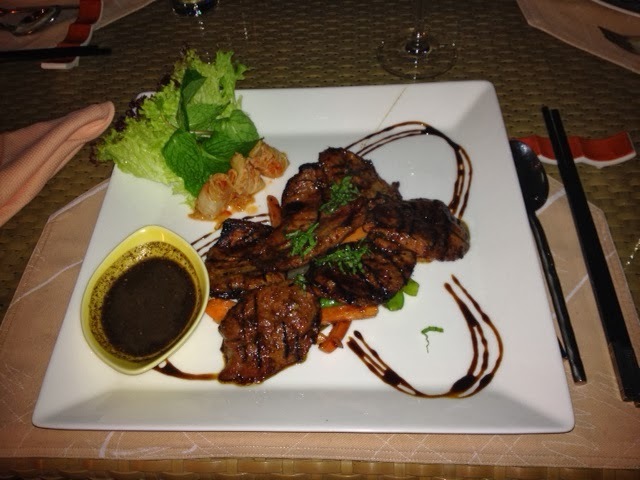 Having been at Hoi An a few times before, I was able to recommend some dishes to our party. This made me realise that with a cuisine that is not as well known to people, it is a challenge when wading through a menu. 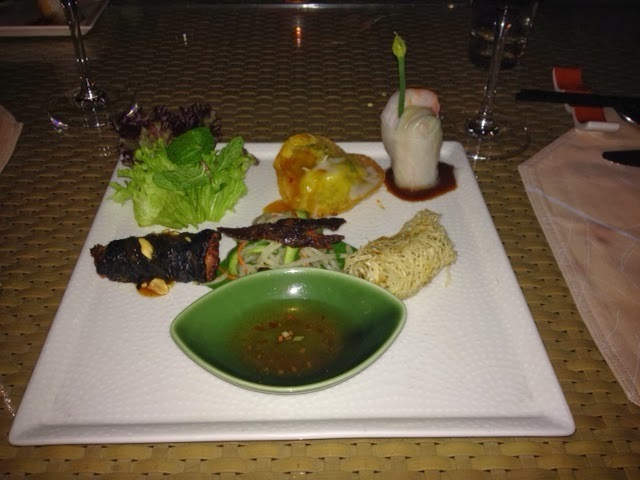 I was therefore all too happy to recommend the tasting platter of Vietnamese delicacies which included spring rolls in rice paper, crispy nest spring rolls, papaya salad and chicken sausage. 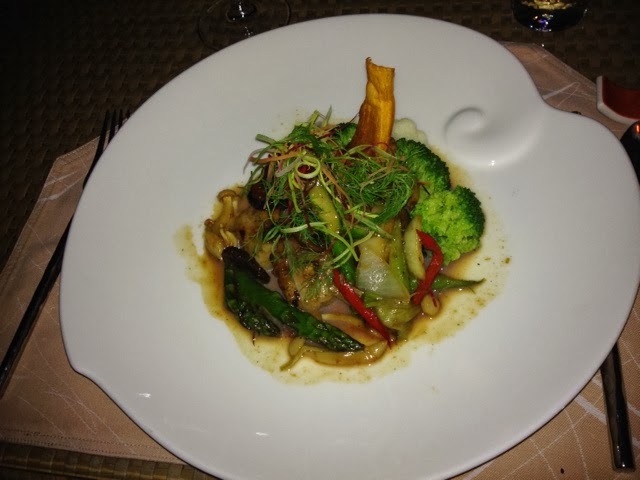 For mains, we ordered the sea bass in lotus leaf - last time I had the sea bass in banana leaf - the grilled lemongrass duck breast, wok tossed duck and the scallops. But for those first timers of Vietnamese cuisine, relax -the menu includes Chef's recommendations. You cannot go wrong with the tasting platter. Papaya salad from the tasting platter. The unanimous feeling is that the food was exceptional. Two of our party spent a week in Ho Chi Minh city last December, and they were impressed, as was Jean Emmanuel. The sharing platter was a big hit and the three we ordered were munched down with civilised gusto. After that, we were given the palate cleanser in the form of a lemon sorbet. This was probably the only thing that needs working on. It was too sweet and overpowering in its sweetness. The mains, soon after, were well received. 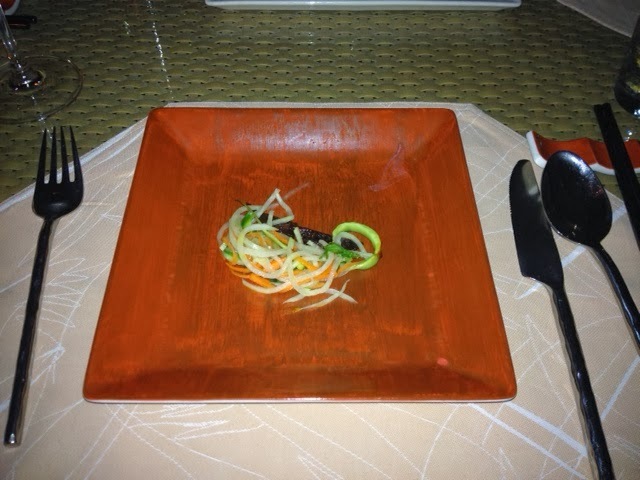 The winner for presentation was definitely the sea bass in lotus leaf. The use of the lotus leaf instead of banana leaf lends itself to a better presentation because the lotus leaf is more likely to follow the shape that the chef wants it to. Also, the motif of water connects the sea bass and the lotus. The picture is worth more than any words I could use here. However, my duck too had a beautifully balanced presentation. Dessert. Well, it had to be the chilled mango soup, and 4 of us ordered it while the remaining member of our party ordered the ginger creme brûlée. Fantastic all round. 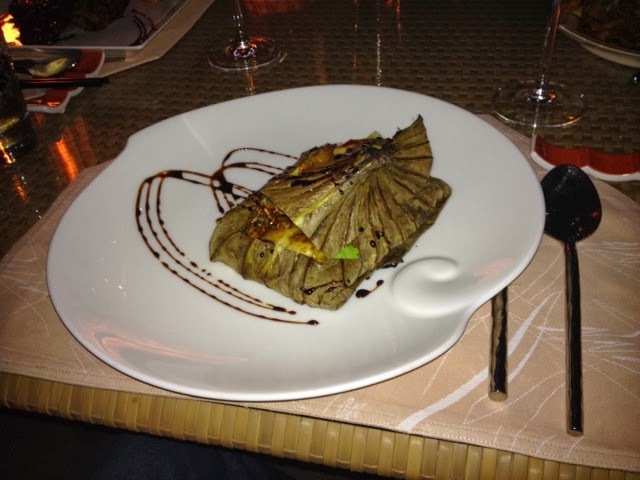 Dish of the night - sea bass in lotus leaf. In my previous Hoi An post I spent a bit of time writing about the food. 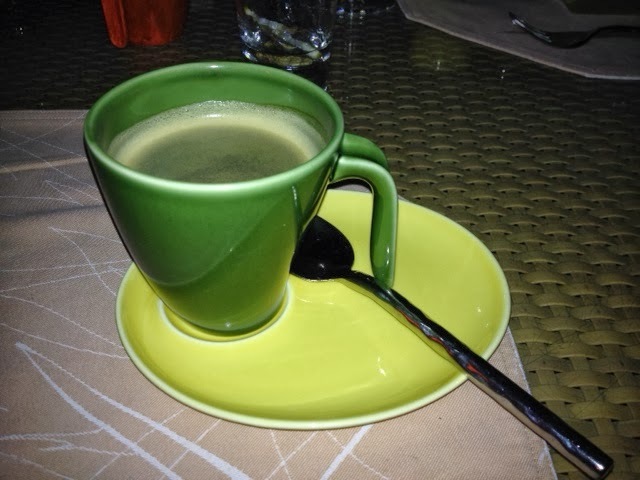 This visit, while the food was exceptional again, was about taking the joy that is Hoi An to other people. It was blissful watching the others appreciate the magic that was conjured by Chef Ha and her team. Chef Ha cooks with heart, and you feel it in her dishes. No, you can taste it in her dishes. Her attention to detail too in her presentation made a marked impression on all of us. It was a pleasure for me to hear my friends comment on the fact that the waiters are there, but they are not there. 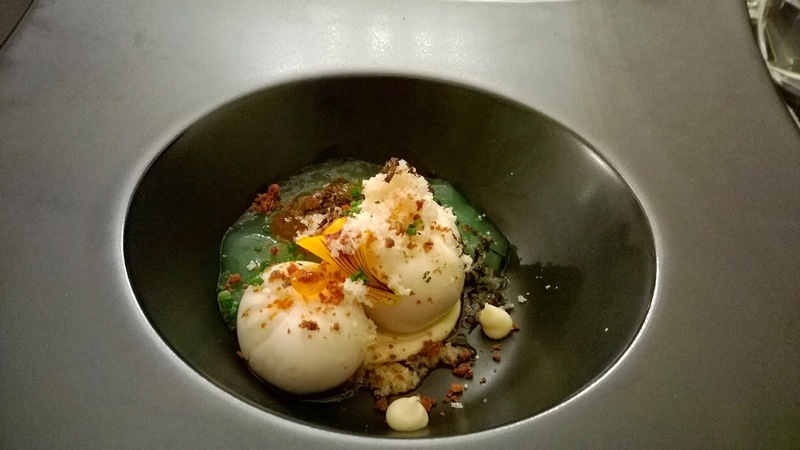 They are confident enough to stand back and let the food mesmerise guests and offer service when required. It is unobtrusive service at its best. There is a fine line between eagerness to serve while creating an atmosphere of a home kitchen. The staff at Hoi An really make you feel you are at home. 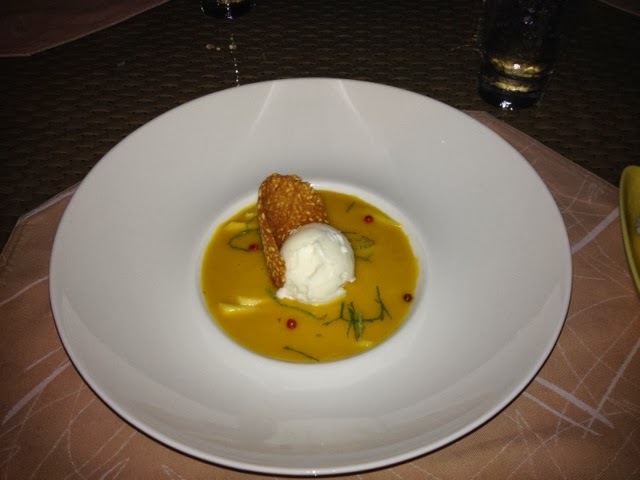 The oft-written about mango soup with coconut ice cream and pepper corns. Emphasis on the delicate at Hoi An. After dinner we met Chef Ha and Jean-Emamnuel asked her if he could do a feature on her in his magazine. It meant two things: we would return the next day (he was going back home France two days later) to take pictures of her and two of her creations, and secondly, a guest writing slot for me in his magazine in which I could share with readers something about this special place. Life is indeed what happens while you are making other plans. Jean- Emmanuel capturing the perfect picture the next day. It was an evening that celebrated the birthday of a dear friend. It was an evening taking a magnificent orchid out of the dark and putting it in the light for people to appreciate its beauty and fragrance. It was an evening in which someone would share this beauty with people back home in France. 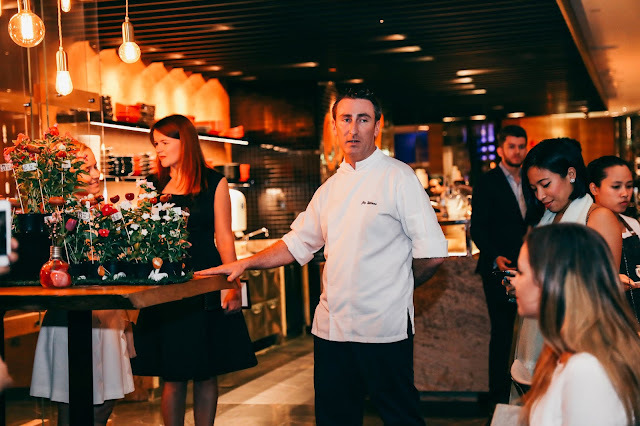 It was an evening in which food was elevated to high art forms by Chef Ha. Yes, it was an evening where professional, warm and intimate service was so gloriously displayed. It was an evening which was, in a word, memorable.